In order to safely manage hazardous wastes it is important to understand what exactly a waste is, what its hazards are, how it can react, and the proper storage practices associated with each type of hazardous waste. Once a waste is produced, it should be characterized before it is transferred to a storage container. The characterization process should include identifying the hazards and properties of the wastes that are generated. If incompatible hazardous wastes are transferred into the same storage container, the possibility of an explosion or fire occurring is greatly increased. If you are unable to characterize waste materials, hazards and/or chemical properties, contact your local environmental official for further guidance on proper handling and storage practices. Understand the risks associated with each hazardous waste being stored. When transferring hazardous materials make sure grounding systems are in place. Use a funnel to prevent hazardous waste spills (do not use the same funnel for all wastes). Keep incompatible wastes in different rooms, separated by solid partition walls. Segregate wastes in separate containers (drums, totes, pails etc.). When storing flammable and combustible wastes make sure to implement explosion proof or non-explosion proof accessories. Certain chemicals can expand from temperature changes, make sure to store these chemicals in a temperature controlled room. Always wear proper protective equipment when transferring or handling hazardous wastes. Label hazardous waste containers properly with chemical contents, dates, and DOT labels (contact local officials for labeling requirements). Maintain hazardous waste storage by keeping track of inventory dates. Do not stack containers inside your hazardous waste building. Use proper ventilation systems to maintain a safe storage atmosphere. 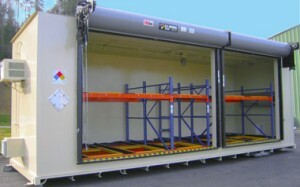 Hazardous waste storage buildings by US Chemical Storage offer a safe, secure and 100% compliant waste storage solution. Compliantly store your hazardous wastes with a safe, secure and dependable hazardous waste building by US Chemical Storage. Offering customizable storage solutions for all types of hazardous waste storage requirements. Store your hazardous waste inside, nearby or far away from your facilities with our wide range of construction designs. All hazardous waste buildings by US Chemical Storage offer a 15-year structural warranty and a 2-part epoxy top-coat for protection against extreme weathering elements. Designed from heavy-gauge steel for maximum durability and strength. These waste buildings meet EPA, OSHA, NFPA and FM or Warnock Hersey approvals. Customize your waste storage building to handle flammables, combustibles, corrosives, acids, or other hazardous materials. These hazardous waste buildings are constructed for complete safety.